The twins really enjoyed trick-or-treat this year. Their complementary costumes garned a lot of fun comments from the folks passing out candy, and the girls mostly enjoyed it. 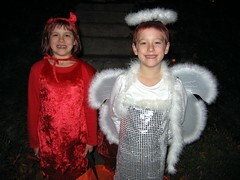 About halfway through Tyler confided that she was getting a little tired of everyone saying “An angel and a devil! How cute!”. Later she also complained (rather loudly, as she left someone’s porch) that she didn’t really like trick-or-treat because some people pass out yucky candy. They each collected an enormous pile of candy. In years past, our neighborhood hasn’t been that great for candy collection; but this was certainly a banner year. It reminded me of my own days trick-or-treating, when I’d fill up a large pillow case with the good stuff. The neighborhood was bustling with families, and everyone was in a good mood.